WHAT IS IT? Factory Connection offers a performance kit for the 2018 Honda CRF450 that goes hand in hand with its re-valve that is tailored to your height, weight and skill level. WHAT’S IT COST? $450.00 (front & rear re-valve, not including fluids and springs), $224.95 (shock linkage), $159.95 (performance kit). CONTACT? www.factoryconnection.com or call them at (800) 221-7560. WHAT STANDS OUT? Here’s a list of things that stand out with the 2018 Honda CRF450 suspension modifications by Factory Connection. (1) Stock. From 2017 to 2018 Honda improved upon the CRF450 Showa components by upping the front and rear spring rates to allow the bike to ride higher in the stroke. This actually made the forks feel more supple. How? Since they rode higher in the stroke, there was more travel to work with. We were able to soften the compression damping, making for a more fluid stroke; however, we did have issues with harshness at the top of the fork’s stroke, followed by a lack of mid-speed compression damping. The result was a fork that chattered in the braking bumps and dove excessively in big holes and hard landings. (2) Modifications. We had Factory Connection set our 2018 Honda CRF450 up for a 200-pound Vet Pro. Factory Connection did a very thorough job getting information about the rider. FC asked the right questions to get the answers it was looking for. Factory Connection has developed tactics to figure out how fast you really are, not how fast you think you are. When our tester said he was a Pro, FC set up his suspension more for a fast vet rider due to the Q&A process. Forks: Factory Connection used its new Performance kit ($159.95) for the CRF450 forks. This kit includes multiple internal parts that work in conjunction with the re-valve. The FC re-valve changes shim settings in all three areas—BCV, compression and rebound. Shock: The shock re-valve includes modifications to the compression adjuster assembly and valve setting. 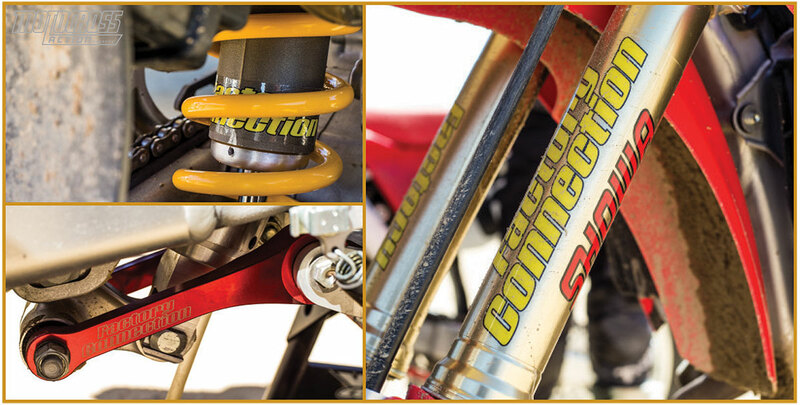 The main shaft compression and rebound settings are personalized to the rider’s specific needs. Also, a longer Factory Connection shock link was used ($224.95). (3) Performance. Honda claims that the Showa forks that come on the CRF450 are close to A-Kit components. Maybe so, but they sure don’t feel as good as A-kit components. If the valving is wrong, the components won’t work no matter how trick they may be. This is where Factory Connection has done its homework. FC turned the initial harshness into a plush feel that allowed our testers to loosen their grip. The mid-stroke felt firmer, stopping the forks from diving under hard braking, yet it was supple enough to absorb holes and big braking bumps. Bottoming resistance was also increased for hard hits and big jumps, giving our riders more confidence. The shock worked well with the forks. We felt the rear tracked the ground much better than the stock shock. What was most improved was the shock’s ability to absorb large, square-edge hits under a load. It was almost as if they weren’t there. The bike could plow through rough chop under acceleration with the rear end stuck to the ground and tracking dead straight. WHAT’S THE SQUAWK? The price may seem high, but the improvement is worth the just-over-$800 price tag. Of course, if Honda had done a better job, Factory Connection wouldn’t have anything to change. MXA RATING: If you are having trouble getting your CRF450 suspension dialed in, Factory Connection has the knowledge, experience and products to tailor its components to your liking. Factory Connection’s setup made the CRF450 into a better-handling, easier-to-ride and more comfortable bike. We loved it.